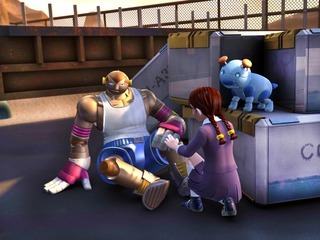 Rhymer secretly meets Steeljaw Jack, the notorious killer robot, in the Iron Tower. Steeljaw Jack demands an exorbitant bounty for hunting down Marty and Ally, and Von Rhymer has no option but to agree. Meanwhile, ex-boxing champion George hides Marty and Ally from the frequent roadside checkpoints and the attentions of a gang of Desert Bikers, and offers to take them in his truck all the way across the Great Desert. The scheming Jimmy, trying to get in on the reward offered by Von Rhymer, follows at a distance. At a rest stop George gives Marty some boxing training, and Jimmy sees his chance. He sends Machine Number 5, a fearsome robot fitted with an illegal engine, on to the attack. Marty freezes with fear, and despite a noble struggle, George is thrown to the ground like a rag doll.